The pump brings up water from a well. Pumps were often attached to windmills to fill a tank. By elevating the tank - and letting the water run downhill into the house - indoor plumbing was made possible. A pump works like this: When the handle is pushed down, a plunger is lifted and a vacuum is created below the plunger. Water is sucked into this vacuum and runs out through the spout. 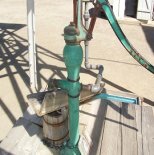 Hand pumps were common in the 1870s and gasoline powered pumps became common by 1910. A rope and bucket had been used for centuries. In the 1840s, chain pumps were introduced. Cast iron pumps were becoming common in the 1870s. It had a number of advantages in both the ease of use and the ability to close off the top of the well to prevent contamination of the water. It was later attached to a windmill to fill a tank. The elevated tank allowed for the introduction of indoor plumbing. By 1910 gasoline engines started replacing the windmill. Eventually city water supplies were introduced to replace private wells. 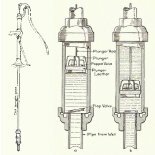 The plunger pump represents a type of which there are several forms All have the same general construction in that the pumping-parts consist essentially of a cylinder and of a plunger, or piston. Plunger pump may be classified as single-action pumps or double-action pumps. A single-action Lift pump is shown. It is called a lift pump because the top of the standard through which the plunger rod works is open so that water cannot be forced higher than the spout. It is called single-action because, as will be shown later, the greater part of the water is delivered on the up stroke of the plunger. The action of the pump is as follows (a) the plunger is being lifted by the down stroke of the handle. As it passes upward there is a tendency to create a vacuum below the plunger, pulling in the water. On the down stroke of the plunger (b) the flap valve closes, the poppet valve is lifted off its seat, and the plunger finishes its down stroke with all the water above it. In the next up-stroke of the plunger, the water above it is lifted up to the spout, while at the same time a new charge is forced into the cylinder from below. It is seen that water is lifted to the delivery spout only on the up stroke of the plunger, which corresponds to the down stroke of the handle; hence the term "single-action. This is a single action water pump. It is set up for manual use so you can see how it works. If it was actually attached to the windmill, the handle would be removed and the spout closed off. A pipe can be seen from the back of the pump which leads to the water tank. The wood drive bar can be seen coming down from the wind mill mechanism to the top of the pump. Charles B. Dempster opened a retail pump and windmill shop in Beatrice, NB in 1878. The Dempster Mill Manufacturing Company began producing windmills, pumps, water tanks, towers, well machines, and related equipment in 1886. The company's success led to nationwide sales, and by the 1920s, Dempster boasted branch houses in six other states. The company, still located in Beatrice, continues to manufacture ag-related products as Dempster Industries, Inc.